The Denver Broncos' first major decision for Super Bowl 50 was a curious one: They will wear their white jerseys, the team has announced. The decision is eyebrow-raising on a couple of levels. As the designated home team, the Broncos had the first choice about which color jersey to wear, and typically teams wear their color jerseys as the home team. Before the announcement, ESPN's Paul Lukas, who also writes a daily column at Uni-Watch.com, had called the idea of the Broncos ultimately deciding to wear their white jerseys "highly unlikely" based on their own history. "Aside from 1971, when they wore white at home for the entire season, the Broncos have worn white at home for only a handful of games in their history," Lukas wrote. More important, the decision suggests that the Broncos are worried about their own history in the Super Bowl — which is not great — just as much as they are worried about the Carolina Panthers. In making the announcement that the Broncos would indeed defy convention and wear their away jersey, John Elway, the team's executive VP of operations and general manager, cited the team's past Super Bowl performances for the decision, strongly suggesting this was a decision based on superstition. "We've had Super Bowl success in our white uniforms, and we're looking forward to wearing them again in Super Bowl 50," Elway said. While Elway refers to the team's "success" in white uniforms in the Super Bowl, it would seem what he is really referring to is the team's lack of success in the Super Bowl while wearing their orange jerseys. While the team did win a Super Bowl in white, they also lost one in white. The Broncos are 0-4 in Super Bowls while wearing orange — including two years ago when they were thumped, 43-8, by the Seattle Seahawks. But to turn away from the orange jersey because of past Super Bowl results also means the Broncos will be turning away from their success this season. The Broncos are 8-1 this season, including the playoffs, in their orange jersey, while they are 5-2 in white. 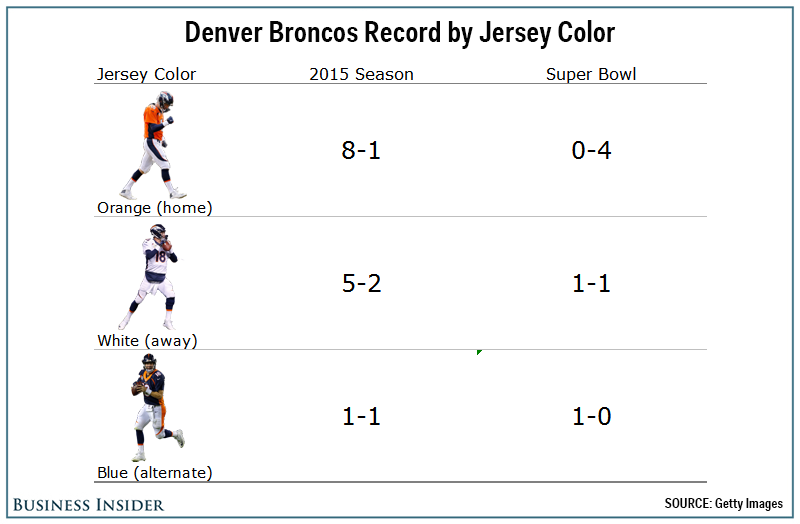 How the players perform will determine whether or not the Broncos will win the Super Bowl and not their jersey color. But athletes are notoriously superstitious, and with the Broncos opting not to wear orange, it shows their own Super Bowl history is in their head more than this one game. That seems like a strange way to start the two-week run up to the Big Game. Meanwhile, the Panthers are showing that they are not worried about past results, as they will wear their black jerseys despite being 0-2 in the playoffs with that color choice.